Of the 156 U.K.-based companies exhibiting at MIPCOM, 122 are from London and, except for brief pauses for Brexit, they have been busy preparing for MIPCOM since June. The bulk of these preparatory tasks tend to fall to the marketing teams — behind-the-scenes professionals who make everything look easy because they always have multiple solutions up their collective sleeves — plans “A,” “B,” and “C,” if you will. Throughout the market, they will be the ones who make sure everything runs smoothly for their salespeople, ensuring that their new shows are well positioned and receive the proper media exposure, and that talent on the floor receives the attention it deserves. Additionally, they will be the ones supervising the set up of the stands, arranging interviews for their top-level executives, organizing parties or press conferences and working with the security people to guarantee that everything runs safely and smoothly. For every key market — starting with this Issue’s in-depth look at London — VideoAge will review the marketing efforts of companies in major territories. Next, we’ll feature Toronto, followed by Mexico City/Bogotá/Sao Paulo/Buenos Aires, then the triangle that is New York/Miami/Los Angeles, before heading back to Europe to check out Madrid/Rome/Paris/Munich. VideoAge reviewed the MIPCOM preparations of five of the U.K.’s largest distribution companies. Contributing their comments were: Jennifer Brinkworth, svp, Marketing and Communications, Content Television and Digital; Claire Douglas, Marketing & PR manager, Passion Distribution; Amanda Hill, A+E chief marketing officer, International ; Connie Hodson, vp Content & Marketing FOX Networks Group Content Distribution; and Steve Quirke, head of Marketing, Zodiak Rights. VideoAge: What are some key issues you’re dealing with at MIPCOM? Jennifer Brinkworth: Our marketing team [must] work closely with our acquisitions team and, of course, the shows’ producers, to truly understand the key selling points of the properties we will be launching, so we can capitalize on these in all forms of promotion. We are charged with rolling this new content out and creating a real buzz around the properties in the international market. This is achieved through strong promotion, creative, eye-catching visual campaigns — whether online or in print — dynamic and engaging trailers, and ongoing viral campaigns. We also provide our sales team with anecdotal and other sales support information — for example audience ratings, target demographic groups and reviews. Claire Douglas: Quality time with clients, making each title count and logistics. Amanda Hill: A+E is coming off of a monumental MIP-TV where we premiered Roots. At MIPCOM, we will continue our momentum and create a real moment for A+E Networks to elevate our position as an innovative force in international production, sales and marketing. We will look to continue driving awareness to the pedigree of our growing scripted offerings, and to reinforce our continued leadership position in factual and movies and our growing position in formats. Our market objectives are: Celebrating the power of A+E Networks as a whole — alongside our programs; bringing meaning to the brand — complementing but not overpowering the individual genres and programs; and creating a clear sense of ‘theme’ for A+E Networks at MIPCOM. [In addition, we’ll be] celebrating our new home [at the former Discovery stand. Connie Hodson: Weather, competing events and ensuring we have enough space at the stand for meetings. Steve Quirke: It is our role to make sure all launch programming from our new program catalog is presented to buyers at least two weeks in advance of MIPCOM. With meetings only half an hour long, it is critical that buyers have seen the catalog in advance of their MIPCOM meetings with us so that more titles can be discussed within the time frame. We present our programs in advance through our website and an emailed PDF catalog. While at the market the sales team will use an iPad screening app and a printed catalog to pitch shows. Show marketing [is also key]. There are many distribution companies all trying to get the attention of the buyers who attend the market. In such a noisy environment any marketing campaign or launch event must be well thought through and executed to get maximum impact. Last, it is important that there be a good environment for the salespeople to take their meetings. The exhibition and sales stand must be welcoming, comfortable, look dynamic and set up to boldly promote key shows. VA: How do you position new shows and library material at MIPCOM? Claire Douglas: MIPCOM is the natural place to promote new series and these would lead in any advertising and branding. At Passion Distribution, we always try to give visibility to all of the portfolio — whether long-running series or single doc. We also like to communicate about various genres such as drama and crime, reminding clients of titles that we have in our portfolio. Amanda Hill: We recognize that with today’s evolving media landscape, new and culturally relevant content drives buzz and heightens interest. We prioritize new shows in the vast majority of our communications, but also emphasize the proven performers in our promotional efforts. We create and reflect the cultural zeitgeist. We unapologetically “go there.” Our shows drive ratings and buzz. We partner intelligently — Pulse, Propagate — and have a cool, innovative, disruptive and pioneering spirit. Connie Hodson: Our program inventory is presented on our website and all new titles are featured in our print and digital catalog as well as at our stand’s screening site and on our screening app device. So there are always numerous ways buyers can reach our content at all times. Steve Quirke: We plan on highly focused trade marketing activities, ensuring that each communication is appropriate to particular audiences. Brand new shows will be allocated most of the marketing budget at MIPCOM. Generally we will establish a top list of titles which we know will attract the most attention in Cannes. For market programs, we may create promos and print publicity, advertise in key trade magazines (online and print), book outdoor poster advertising, hold launch events, stunts or screenings, display graphics on the sales stand, etc. Library material is often matched up with current titles depending on a genre that the sales team knows is ‘on trend’ in their particular market. Buyers also often return to library titles largely through researching on our website. VA: Do you find the presence of talent helpful? Jennifer Brinkworth: Talent most certainly adds a sense of buzz and excitement to the launch of any show. We recently launched documentary special Mandela, My Dad and Me at the market and hosted the very talented and extremely popular star of the documentary, Idris Elba. Our cocktail event was oversubscribed and a huge success for everyone concerned, generating great interest, which translated into deals. Plus, the press coverage for the show was phenomenal. Claire Douglas: The presence of talent is always an exciting and valuable way to reach clients and generate interest in a show at the market. Whether front-of-camera talent or executive producers — the presence of talent provides the opportunity for a full 360-[degree] approach to a market campaign, including press, advertising, marketing and events. But they can be demanding — Matilda the House Robot from Robot Wars, who attended MIP-TV 2016 for Passion Distribution, had a very long rider list! Amanda Hill: A+E shows attract A-level talent both in front of and behind the camera. Bringing those stars to a premier market like MIPCOM is a win-win-win. It drives heightened awareness to the show titles that talent are there to promote, it adds credibility to A+E as a destination for attracting top talent, and it helps the talent gain additional exposure of their own, particularly amongst the international market, buyers and press. As I mentioned earlier, A+E is coming off of a monumental MIP-TV where we premiered Roots as MIP-TV’s World Premiere Screening and brought five members of its all-star cast to the market. We [made] plans for top-tier talent to join us at MIPCOM. Connie Hodson: Absolutely. Having the presence of talent helps generate essential press opportunities leading up to the market as well as on the ground. Also, having talent in person at the market shows their support for the series and provides a nice platform for potential buyers and key clients to meet with them and discuss the series as part of the experience in licensing the program. Steve Quirke: In general, talent can be very helpful in raising the profile of a show if they are well-known internationally. Last year, supermodel Rachel Hunter attended Cannes to promote her Tour of Beauty series with us. Rachel attracted plenty of press attention, especially from national newspapers. Talent was also well received for the recent launch of our hit drama Versailles. A screening for 300 people was followed by a Q & A with some of the cast who then had dinner with some of our key clients, which added extra intimacy to the launch. VA: How do you prepare contingency plans (if something goes wrong)? Jennifer Brinkworth: Having survived a couple of Palais floods and the ash cloud, I learned very early on in my career to plan for just about everything. This is the job — and indeed responsibility — of any decent marketer. Critical to turning a disaster into a success story is the ability to draw on a tried and trusted list of contacts and suppliers. Claire Douglas: Planning, planning and more planning — a key part of which is choosing the best suppliers and support teams. Having fantastic working relationships with the various stakeholders involved in the market is key. Amanda Hill: I trust greatly in my fabulous marketing and communications team. They can handle anything and everything! Connie Hodson: I always make sure to have a backup plan in case there are any unforeseen changes and of course it helps to have an incredibly brilliant team that is proficient, experienced and dedicated to ensure the market is a successful one. Steve Quirke: Our team is very experienced and pre-market preparation is very good, so we do not come across too many difficulties at the markets. The only thing you can’t prepare for is the weather. One year we temporarily moved to a stand in a tent when the roof caved in on us following a biblical downpour of rain! VA: In terms of spending per market, what are your key trade shows? Jennifer Brinkworth: MIP-TV, MIPCOM and NATPE remain our key markets in terms of attendee numbers from the Content Television team. The more niche, territory or genre-specific markets provide great opportunities for our sales team through the year, providing unique and tailored platforms for their specific requirements. It is very important to maintain a strong presence across all target markets. Claire Douglas: Traditionally MIPCOM, but increasingly, local markets. Amanda Hill: A+E Networks has participated in all the major content distribution markets for many years. Our priority is growing our global footprint and keeping A+E networks top of mind in the international buying community. That said, MIPCOM and MIP-TV are both critical to our business. Connie Hodson: We have a presence at all the key markets throughout the calendar year across the globe, but MIPCOM is definitely our largest investment. Steve Quirke: MIPCOM, MIP-TV, Realscreen Summit, NATPE (U.S.), NATPE (Budapest). VA: In terms of sales presence, which trade shows do you bring your largest number of sales execs to? Amanda Hill: MIPCOM and MIP-TV have historically been the markets where we bring the largest group of sales members. Connie Hodson: We have a strong presence at both MIP-TV and MIPCOM, but MIPCOM is generally our most attended market, with more of our channel colleagues in attendance. Steve Quirke: MIPCOM, MIP-TV, NATPE (U.S.), NATPE (Budapest). VA: Which trade shows are complemented with local sales calls either before or after the events? Claire Douglas: All trade shows. Connie Hodson: All of them. Steve Quirke: Members of our sales team are always in contact with their clients throughout the year. Calls would peak around the key markets of course but generally contact through calls or emails is maintained all year round. VA: In terms of investments what is the percentage invested in trade shows versus local sales visits? Jennifer Brinkworth: Key trade shows offer an opportunity for back-to-back meetings for our sales team. However, we find local territory sales trips as valuable — if not more valuable. They allow sales executives to spend quality time with buyers away from the hubbub of the markets, to research [a given] territory’s trends, to understand the requirements of their channels, and ultimately to offer the best line up of territory-targeted content available. Amanda Hill: We are always speaking with buyers, sharing content and, when possible, meeting [in person]. The trade shows create an efficient opportunity to meet with buyers [in person], complementing what we do every day. Connie Hodson: Our sales teams are located in 26 hubs all over the world, so the need for sales trips are minimal. We definitely spend [more] on key trade shows. VA: Is participating at trade show seminars and conferences important for your sales results? Jennifer Brinkworth: Panels, seminars and summit speakers are a great way of elevating PR. We have a number of executives who are consistently invited onto panels to talk about certain areas of their expertise. Connie Hodson: It really depends on the subject matter. But we try to ensure that we are gathering up trade news, new business models and trends. VA: In terms of media: a) What kind of editorial coverage do you expect or plan for? b) In terms of importance, can you estimate pre-market vs. during-market vs. post-market editorial coverage? c) In terms of during-market presence, the key options are the printed dailies and billboards; how do you plan for daily coverage? Jennifer Brinkworth: We work together with leading PR company Lippin Group on our editorial strategies. It is key to plan your editorial calendar to ensure a strong and steady flow of news into the marketplace across the year. Having longstanding relationships with the editorial teams across our target trade publications means we are well positioned to place news pieces as they break. Pre-market and onsite editorial coverage generates a valuable buzz around our activity and latest launches which is vital to support our sales team. 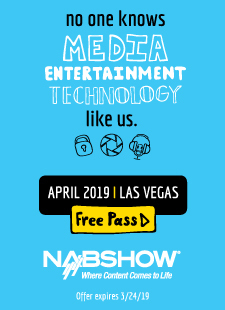 Post-market coverage, particularly sales highlights, is a very effective way of reinforcing that the show is a “must-have” in the eyes of the channel buyers as they finalize their acquisitions, and also helps to strengthen our company profile as we meet with producers to discuss their new titles. Most publications offer a daily news feed, which we tap into to ensure ongoing coverage. 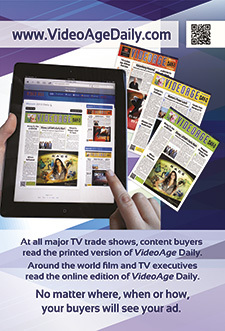 We couple this with the MIPCOM Daily and of course VideoAge Daily publications for maximum impact. VideoAge also offers great “at-market” photo opportunities to accompany key launches and promotions. Claire Douglas: Pre-market activity is very much about getting your message out there and making clients aware of your slate. During the market it is about continuing that message face to face with clients. Amanda Hill: With our focus being on four key genres (scripted, factual, movies, formats), we ensure that we have sufficient coverage across all genres and their corresponding buyers. We also plan on having our key executives profiled in the trades so the greater community can understand our vision from the leadership of A+E Networks. Markets aren’t when we hope people first think of A+E Networks. The market is a time to stay top-of-mind. To that end, pre-market coverage is a priority to introduce key titles and news. We then use the market and sometimes post-market to remind and reinforce. We strive to have a healthy balance of the critical dailies and billboards, and we also believe in digital media as an emerging form of communication with the buying community. Connie Hodson: We always focus on pre-market and during-market. [At MIPCOM] we have a busy schedule and editorial coverage will be extensive. [While] billboards are a constant reminder of the program being promoted, we fully support dailies [as a way of delivering] fresh news. [At MIPCOM] we are announcing our new name and logo, as well as promoting a strong line-up of scripted and unscripted new titles. Plus, launching our new format slate. In addition, we are thrilled to be given the support of National Geographic to host the worldwide premiere screening of their new science series Mars, which will be held at the Palais on Monday, October 17. On Tuesday evening we will be hosting a beach party to promote our library of new and existing Turkish drama, and to introduce a new high-profile drama, with talent and producers joining us. Steve Quirke: Pre-market, we will check features lists sent by the trades and discuss if we want to contribute. Often we will then consider trade advertising in the same magazine, which may support the featured article. You have to be careful though for this not to be seen as paid-for editorial support, which is not the intention. An accompanying trade ad just makes sense in some instances. Some magazines lean toward minimal editorial support unless you advertise, which can be frustrating. There are so many trade magazines sent to buyers’ desks and on the shelves at MIPCOM, it is difficult to know how many of these one person can read through. It is a crowded and competitive market. Editorial is equally important pre-, during and post-market as this is the time when buyers are actively learning about new shows and trends. The question is how much time they have to read them!